IoTSIP makes it easy to find remote IoT endpoints, make connections and transfer data (communicate) between these endpoints for any and all types of IoT applications, creating a completely data agnostic paradigm. The simplicity of IoTSIP addressing enables IoT devices to easily use the Session Initiation Protocol (SIP) to discover the IP address of a desired contact and establish a data connection. SIP addresses are written in sip:user@domain.tld format in a similar fashion to an email address making a human friendly structure suitable for a wide range of business and consumer applications. IoT devices that the OEM needs to track and with which they communicate – this structure provides secure, scalable, device self-managing registration. IoT devices that need to communicate with other devices, services, or micro services as this structure provides secure, scalable, device self-managing registration with human friendly nomenclature for set-up. 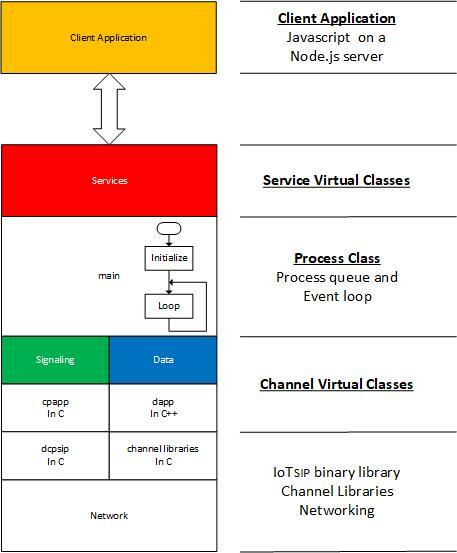 An IoTSIP Application is an IoT Fog Node that runs on any Internet connected device capable of runnint an operating system. Yesterday, in order to find a device in the Fog, the device needed to be hosted by a proprietary cloud service. Today, using IoTSIP (a modified SIP protocol stack) the dynamic address of any device or computer can be found. A set of virtual C++ classes to guide the development of concrete classes to perform the application tasks. The heart of any IoTSIP application is the TeleSoft IoTSIP binary library. SDP/RTP has been removed from the popular standards based TeleSoft CompactSIP product and a new application type added. The new application type allows the exchange of address and protocol information, allowing connections from any web browser. Application tasks are written in fast, efficient C/C++ native code.